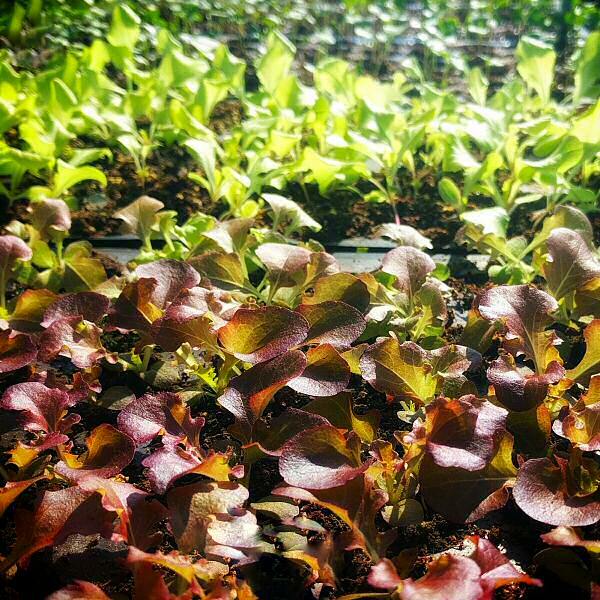 A tiny landscape of lettuces: Especially with the hot, dry weather we’ve been having, you can’t go wrong with a few trays of leaf lettuce seedlings, lending support to the baby greens in the field! Transplanted at 8-10″ spacing, lettuces in a variety of colors and shapes—oakleafs, salad bowls, lollos—can be picked at least a couple of times as leaves for a bigger-leaf greens mix, or thinned as they start to really fill out, with two or three varieties bundled and the rest left to grow all the way. Lettuce options!